After hitting with the 2019 Slugger PXT our hitters found it to feel great off a tee. However, smaller hitters struggled during live pitching due to the serious end load on the bat. We aren’t the only ones to have information about the PXT. Other places, in particular those who sell bats, usually have a boiler plate write up on the specs of a bat. Many of those we reference to make sure we are seeing what we should be. Here are some more references for the 2019 Louisville Slugger PXT review. As we discuss in this video, the PXT is the heaviest swinging drop 10 bat we tested. As such, it is built for the bigger, stronger player who likes an end loaded feel. Or, those smaller players who prefer a more sledge hammer type feel to their bat and are willing to size down an inch or so. In terms of performance the bat is impressive. It ranks among the best with its exit speeds and feel on both hits and mishits. Serious fastpitch players who really want an end loaded bat in the drop 10 space should look to the PXT. Smaller players who really want the bat should size down at least an inch when compared to light swinging bats like the Slugger LXT or DeMarini CF Zen. 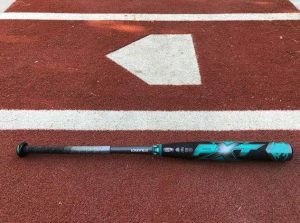 The 2019 PXT weighed out as the heaviest swinging 2019 drop 10 fastpitch bat we tested. But, in terms of feel on contact and exit speeds it was one of the favorites. Our full 2019 Slugger PXT Review follows. Although the Ghost Double Barrel fastpitch bat from Easton is designed considerably different than the PXT the swing weights and barrel sizes are very similar. Feedback from the players we had hit with the bats was also similar. The Ghost Double barrel, however, uses a double barrel design. That is, inside the bat there is an additional barrel that works as a governor. The PXT is just a single barrel with no ring design. After hitting every fastpitch bat over the last several years it is hard to be blown away by a bat. Slugger makes three top end fastpitch bats. The XENO, LXT and PXT are all built for serious fastpitch players and serious budgets. Of the three bats the PXT and the LXT are the most similar. Both use a two piece composite design with the same VCX connection piece. The grips on both bats are the same and the handles are made of the exact same set up. The PXT, unlike the LXT, does not use any rings within the barrel. This delivers a much different sound. Some would say the PXT is an attempt at the DeMarini CF Zen–a big barrelled fastpitch bat with no ring technology. We’d mostly agree. Read our entire conversation on the differences between the XENO, LXT & PXT. This bat is a dud. We purchased brand new and it broke inside within a week. We were sent another from Louisville (we paid 20 return shipping). The new bat had a bent handle. So Louisville did send us another. This new bat lasted 3-4 weeks before breaking inside again. (sounds like the innerbarrel breaks). We did pay another 20 to send it back, and Louisville agian warrentied the bat. But this time they said no more returns. So we are going to trade for a 2018 model. (much better). Like the above user said, don’t buy this bat. Don’t waste you money on the PXT X19 it is a defective bat. I purchased the bat in August of 2018 sent it back in October of 2018. Sent me a new one and 4 month later the replacement bat has the same issue of something loose in the barrel. Don’t buy this bat.